mwe3: The title of the new album 17/66 no doubt alludes to the use of the new 17-string Hybrid Extended Classical guitar and the combined use of the 30 and 36 string guitars that youve recorded with on earlier albums. Did you clearly want to highlight that fact in the title and what can you say about the breakdown of tracks that fall into three subdivisions including 1230z, ML-G/137 and CotHT. Can you shed some more light on these titles and subdivisions? Kevin Kastning: Yes, that is the intent behind the album title. For this record, I wanted a title that was numbers instead of words. My previous records have had titles that were full of meaning, albeit hidden meanings, or meanings only known to me. I never want to reveal anything of what a record is about or its genesis so as to enable each listener to find their own meanings in it. For this record, I wanted to take that concept to a bit more abstract place; hence a title of numbers instead of words. That titling convention extends to the compositions on the record as well. This is the world premiere recording of the 17-string, so that certainly figured into the album title. For the 30-string Contra-Alto guitar and the 36-string Double Contraguitar, I think of them as one large 66-string instrument; its hard for me to locate or define mental or artistic boundaries for them, and in my mind I think of them as the 66. For example, there are four tunings in use across the 66, but none of them are the same. I ensure that each tuning is not only different, but that each tuning provides contrast to every other tuning. I also think of the four tunings at times like one large tuning, which again points to the overarching concept of a single 66-string instrument. mwe3: What else can you tell us about the compositional structure of the three pieces each within the three movements concept? For example, how did you arrive with that comprehensive compositional idea? Kevin Kastning: It was a compositional structure and concept on which I'd been working for at least two years. I had envisioned a solo project consisting of three large compositions; each consisting of three movements; hence, nine movements in total. Even though there are three large-scale compositions on the record, they are all connected. So in some ways, you could think of 17/66 as being one very large-scale composition across nine movements. For 17/66, each one of the three large compositions is performed on one instrument. mwe3: What did you have as a goal when you designed the 17-String Hybrid Extended classical guitar and what kind of strings do you use on the instrument? How would you compare it to your usual classical guitar, which Im guessing you havent played in quite a while. Kevin Kastning: My classical guitar is a 6-string, as are most classicals. It is a wonderful instrument; I am really happy with it. Its a 2008 Cervantes Rodriguez. Very balanced. But Im not playing single-course instruments any longer. And a 6-string instrument in the setting of my music makes me feel straightjacketed. So as regards the classical 6-string, even though I love its voice, was seeing less and less use. I dont think Ive used it on a record in a few years. But I still loved that voice. I am also a huge fan of lute and lute repertoire, literature, and recordings, but I have no interest in actually playing lute. So that was part of the reasoning behind the 15-string Extended Classical guitar: a double-course nylon-string instrument akin to a lute, but still in the guitar family. And with the extended ranges and double-courses, it would allow me to use it in my music, unlike the 6-string classical. 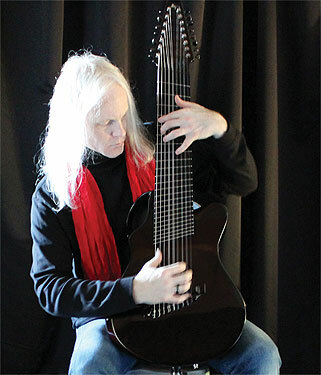 For the 17-string, a hybrid nylon/steel instrument is something Id had in the back of my mind for many years. Id experimented with this concept on a couple of 12-string guitars, but it just didnt work. The softer, lower-volume nylon strings were lost among the louder steel strings, and nylon strings cannot drive the steel-string instruments. Nylon strings on a steel-string instrument just make a soft thud. Putting steel strings on a classical guitar would literally destroy it, as they are braced and built far too lightly to withstand the massive pull of steel strings. So it seemed there was no solution to this. Years ago, Id spoken to a couple of luthier friends about building one. But of course we were back to the same issues as I just described. I had long accepted that this hybrid nylon and steel instrument just could not exist; it could never happen. Then, after the arrival of the 15-string Extended Classical and the miraculous resonant properties of carbon fiber, I again started thinking about this steel/nylon hybrid. I did some preliminary tests on a couple of courses on the 15, and it was very promising, very exciting. In late 2015, I spoke with Alistair Hay at Emerald Guitars in Ireland, the luthier that built my 30, 36, and 15-string instruments, about the possibility of a steel/nylon hybrid classical. We discussed the tests I had done with the 15, and he also believed that this instrument should work. It was a long design process, even though he used the same body as my 15-string. There was so much that had to be redesigned: the bridge, the bridge saddle, the wider fingerboard and nut width; the string spacing took a very long time to be calculated, and the headstock was longer. I believe he also altered the design of the top. The multiscale concept was again used; in fact, the 17 and the 15 have the same fanfret specifications. I wanted to add octave strings to the low E and low B courses, so those are the two extra strings on the 17 over the 15.
mwe3: How is the 17-String Extended Classical guitar different from the 15-string Extended Classical guitar in both sound and function and can you tell us about the different tunings you use on the 17-string? Kevin Kastning: They are similar in some ways regarding body specifications and scale length and the multiscale specifications. The main difference lies in the strings: the 15-string has all nylon strings, and all courses are unisons. The neck on the 17 is wider than the 15. The 17-string has octave strings instead of unisons, and the strings are a hybrid mix of both nylon and steel. For example, the D course on the 15-string is two unison nylon D strings. The D course on the 17-string consists of a nylon D string and a steel octave D string. To my knowledge, this nylon/steel hybrid scenario has never been done prior to this instrument. It sounds like nothing else. I am really happy with how it turned out; so much so that I had to include it on this record. Originally, the title was to be 15/66, but when I heard the 17, I knew it would better fit the overall compositional esthetic and direction of this record. All three movements of the 2nd composition on the new album, "ML-G/137," are performed using the 17-string. 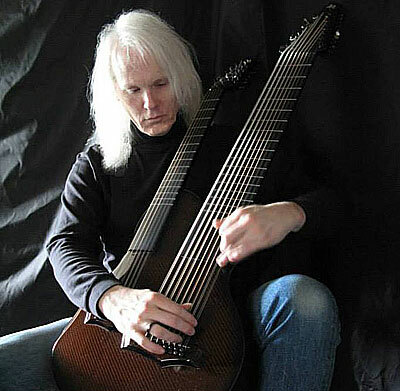 The 17-string is tuned in unisons and octaves. Low to high, the current tuning is F#, B, E, A, D, G, B, E, A.
mwe3: Sándor Szabó is listed as album producer. What input did Sándor have a producer on 17/66 and did you and Sándor have certain guidelines when it came to the direction and scope of 17/66 before, during and after the recordings? Kevin Kastning: Thats a great question. I had the album almost completely recorded when I started to explain the album concept to Sándor. So he didnt have input on the overall concept, as the concept was already fully realized. I always have the overall concept of the record in mind before tape ever rolls in the studio. Besides his role as producer, he also mixed and mastered the record. Sándor is a brilliant mix engineer, and provided mix suggestions along the way. As a producer, he will often provide much-needed input and opinion on specific pieces. His guidance is invaluable to me when Im working on solo projects. mwe3: In your liner notes of 17/66 you discuss the Wotruba Cathedral and you compare it to the harmonic blocks concept you had in mind. I had never seen a church with that type of jagged yet geometric construction. How did you discover Wotruba and can you explain how the harmonic blocks concept veers from compositional structure into the realms of music theory? I know you are classically trained, from a harmony standpoint but this is quite a unique sonic conceptualization. Kevin Kastning: The harmonic blocks concept was developed four or five years ago; it is something on which Ive been working leading up to the recording of 17/66. To explain it very briefly: it involves opposing or contrapuntal two-handed chordal tapping on the 30 or 36. For example on the 36, I can tap 8-voice chords in each hand; hence 16-voice chords are achievable. These are pretty harmonically dense structures, and I do not hear them as, or think of their theoretical functioning or theoretical analysis as chords. Due to their densities and complexities, I hear them as what I call harmonic blocks. I can use these in a contrapuntal structure and setting such that these two sets of 8-voice chords, or sometimes 6-voice chords, are used as and functioning as polytonal lines, instead of using single-note monophonic lines as polytonal lines. In this manner, chords, or in my case, harmonic blocks, become actual counterpoint itself. This is instead of or actually replacing separate monophonically-based linear counterpoint. This theory is on most of the album, but is more present in the final track 15.5mH. As I was figuring this out, I had some drawings to represent it, along with writing out some examples on score paper. The drawings were helpful in helping me physically and visually grasp some of these concepts; to be able to see it instead of only hearing it. I am a big fan of architecture; I read about it quite a bit. I had been doing some research on Brutalist architecture. I knew nothing about it, so I was reading about it so as to better understand it. Im not that enthralled by Brutalism, but some of the underlying concepts were interesting to me. This was happening about a year before the recording dates for the 17/66 project. As I was reading about Brutalism, I found the Wotruba Cathedral in Vienna. This cathedral is for me the most beautiful example of Brutalist architecture. When I found it, it just stopped me dead in my tracks, as the Wotruba was very similar to the drawings I had of the harmonic blocks concept. It looked like what I had been hearing for the past few years. Finding this physical manifestation of what I was hearing and on which I was working was not just a coincidence; I believe the timing happened divinely. During the recording sessions, I had a few photos of the Wotruba around the studio. It was helpful to me. The pieces on the record are not based on or inspired by the Wotruba Cathedral, but there is an absolute connection there. mwe3: You always find the most interesting artwork and that is clear on 17/66. Tell us about working with English artist Chris Friel (cfriel.com) and something about the artwork / photography chosen for this album. His web site is pretty fascinating. How did you locate Chris? Kevin Kastning: I met Chris probably 8 or 9 years ago I think. At that time, I was interested in the new work being created by the Intentional Camera Movement (ICM) photographers. For me, this was almost a new art form, and I really liked it; it seemed to contain more emotional depth and heft than some other forms of photography; at least to me. I liked most of the ICM works I saw, but I kept seeing some ICM photos that really knocked me out, and every time Id check to see who was the photographer on these, it was Chris Friel. I sent him an email introducing myself and I shared some of my music with him. I also asked if he thought I might be able to use one of his works as an album cover, as his work visually fit to my work so incredibly well; in some cases, there were some of his photos which in my mind looked as if they were constructed from my music. Of course Chris had not heard my music at that time, but that was the strong visual connection I felt. Fortunately for me, Chris liked my music and agreed to doing the album covers. Is is a very arduous and a long process to locate the perfect cover art. For me, the cover art must fit the album project. It has to have a direct tie-in, connection, or representation of or with the music on that record. When the recording sessions for the album that would become 17/66 were completed, I knew that something of Chris would fit this record. This record is more dense, more abstract, than my previous solo records. Chris work has the abstraction for sure. Plus there were new tunings used on it for the 30 and 36 with which Id never previously recorded, and the new 17-string. So, while this record was so dense, there were new colors buried in and threaded throughout those densities. The new colors being the new tunings and of course the 17-string. I had seen this photo that became the cover art a year or so ago, and it had really stuck in my mind. When I started to think about cover art for 17/66, I knew this piece of Chris's was right for it. The more I looked at that photo, the more I could start to see the pieces on 17/66 emerging from it. The three colors in this photo representing the three main compositions and the three instruments; the abstraction; the densities; the movement; it was all there and fit the album ideally. Im very grateful to Chris for the album covers hes done. He is truly an original and unique artist, and I think his art is just tremendous. mwe3: 17/66 was recorded during the early winter of 2018 so is that why the sound is particularly dark? Is it coincidental that 17/66 and your prior album A Connection Of Secrets were recorded in the depths of winter, albeit a year later? 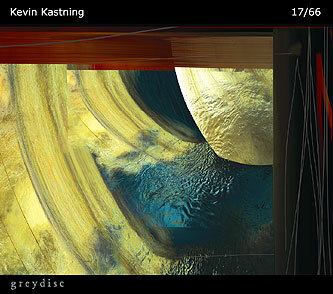 Kevin Kastning: I think the darkness to which you refer is inherent in the compositions. However, I do prefer recording during winter. I don't think it was a coincidence, no. Solo projects are large and arduous endeavors for me, and embarking on those projects during the winter months just seems natural. The album consists of three large compositions, each in three movements. Each large composition was recorded in one night. So the entire album was tracked over three nights; one in late December 2017, and two in early January 2018.
mwe3: How many guitars has Emerald Guitars made for you and when did you meet Alistair Hay? Are you planning new instruments with him or other builders in the future? Kevin Kastning: I met Alistair in 2011 or 2012. So far, Alistair has made five instruments for me. At present, we have two new instruments in design stages. mwe3: Tell us about working with Emerald and how you went back and forth in the making of the 17-String Classical. Was there a prototype guitar made that you made your modifications on as it was further developed and how long was the 17-String guitar in production? 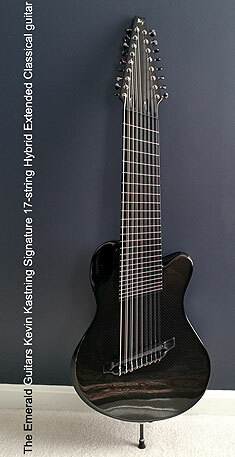 Kevin Kastning: Overall from my proposal to the delivery of the 17-string was probably close to two years, I think. When I propose a new instrument to Alistair, I'll send a kind of statement of purpose for the new instrument; what it's meant to accomplish. I also send written specifications to him. I'll include a strings and tuning chart, along with string gauges for each tuning. Soon after, we'll have a long Skype about it. He'll then go away and think about it all, and determine if it is possible and if so, what's involved. He will often make suggestions to my first pass at the specs, which is quite helpful. Sometimes a full-size cardboard mockup is involved in the design stage on his end. After we've agreed on the full specifications, down to string gauges and everything, he will start the build process. From the finalization of the specs to the start of the build process can be several months, as he has a wait list. During those months we are both thinking a lot about the new project, and details can change, which is also good. During the build process, we will have more Skype sessions, as he may run into new challenges that were previously unforeseen with these instruments. We'll discuss string gauges and setup factors when that time arrives. 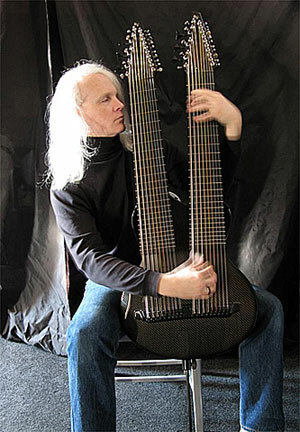 There was not an actual 17-string prototype. But the 15-string and the 17-string share so many design specs that in a way the 15 was the prototype or the test platform for the 17, as I did some steel-string tests with it when I was making the first set of specifications. I consider Alistair to be my partner on the same level as Sandor, Mark Wingfield, Carl Clements and others. I couldn't do what I without his support and luthiery genius. And I don't use the word 'genius' lightly. mwe3: In the 17/66 liner notes you list other guitar builders including Daniel Roberts Stringworks and Santa Cruz guitars. What is your relationships like with the other guitar builders and guitar tech companies and do you have some other favorite current guitar builders in the US or other countries who are doing interesting works in you opinion? Have you gotten feedback from other guitar companies about your unique guitars? Kevin Kastning: I have had interesting comments from other luthiers, yes. They seem intrigued. Santa Cruz made several excellent instruments for me; most recent was the 2006 12-string Extended Baritone and the 2008 12-string Alto guitar. Richard Hoover (owner of Santa Cruz Guitars) has always been very supportive and helpful to me. Daniel Roberts Stringworks built the first two Contraguitars for me. Those are beautiful instruments, and Dan has been really supportive. Currently, I don't have any instruments in the works with any other luthiers or companies other than Emerald, but I am still thankful for the support I've been shown as an artist endorser from both Santa Cruz and Daniel Roberts Stringworks. Another luthier whose work I admire is Laurent Brondel (Maine; US). He specializes in 6-string acoustic guitars. His instruments are beautifully balanced and really have their own voice. mwe3: You were discussing future releases on Greydisc with Carl Clements, Mark Wingfield and also Mike Metheny as well as a trio album with Sándor and Carl as well. Sounds like 2018 and 2019 are going to be busy years for you. Youre really keeping the critics and the listeners in both awe and suspense. Moving ahead, one can only hope to keep up with your prolific recording schedule. Kevin Kastning: Yes, for the past few years I think that the current year is the busiest and it can't get any busier going forward. But it always does. Those album projects you mentioned are all in the works or completed; most will be released in 2018. Other records for this year are an album from 2002 with Siegfried which was never released. The trio with Sandor and Carl which was recorded in 2015 will be released this year. My next solo record is already completed and will be released in late 2018. There is a trio record with Sandor and Balazs Major which is entirely different for us, and will be released in summer 2018. Carl and I are at work on a new record, and Sandor and I will be recording a new album after the 2018 European tour next month in Budapest. Mark Wingfield and I are back in the studio in August. And I'm at work on some more piano recording projects. So yes, I'm staying busy and happy to be so.